Most alfalfa stands overwintered well; however those on heavy soils and in low-lying areas may have suffered winter injury. New seedings and annual forage acres are expected to increase this year in response to weather conditions over 2016 and 2017. As of May 27th, alfalfa weevils had reached 1st instar. Scouting is advised to identify if alfalfa weevils may be a problem before damage occurs: 3rd and 4th instar phases cause the most damage to the crop. This timing looks like feeding will affect regrowth after first cut. At the beginning of May, alfalfa green-up and growth was approximately two weeks behind normal. Rapid accumulation of GDDs has enabled fast growth, and estimates are that hay harvest is generally delayed by a week. First cut for 4-cut systems began in earnest the week of May 28th. Pastures also experienced a slow start. Livestock on many farms were turned out too early, due to low forage inventory of adequate quality. Those able to hold off until field conditions and pasture yield improved will have better performance from their pastures for the rest of the year. While Essex and Chatham-Kent received between 150-200% of average rainfall for May, most of the region had 60-85% of average precipitation. Most alfalfa stands overwintered well; however those cut late last fall, or that received a late manure application were more likely to suffer winter injury. 2017 seedings stressed by wet conditions and potato leafhopper in should be monitored closely. At the beginning of May, alfalfa green-up and growth was approximately two weeks behind normal. Grasses are getting ahead of alfalfa. Rapid accumulation of GDDs has enabled fast growth, and estimates are that hay harvest is generally delayed by a week. First cut on dairy farms began the week of May 28th. As of May 27th, alfalfa weevils were nearing egg hatch. Scouting is advised to identify if alfalfa weevils may be a problem before damage occurs: 3rd and 4th instar phases cause the most damage to the crop. 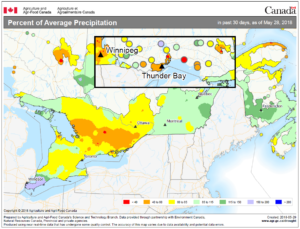 Most of central and eastern Ontario received below average rainfall during May. There is currently limited alfalfa regrowth in many areas thanks to a cool, slow start to the spring. Winterkill has been an issue in Temiskaming due to drowning out after an early thaw left standing water in many field. 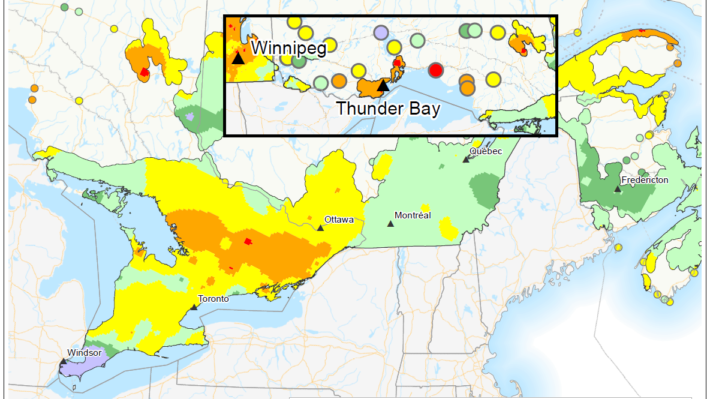 Timing is variable across the region: in Algoma forages seem delayed by 2-3 weeks, while Cochrane District is experiencing more normal timing for green-up. The main challenge will be grasses getting ahead of legume development in areas where green-up and growth have been slower than normal. Estimates suggest 1st cut hay might begin as early as next week in Nipissing, and the 2nd week of June in Temiskaming. 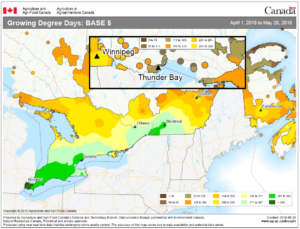 Algoma, Manitoulin, and Temiskaming had average rainfall in May, while the rest of the region received 60-85% of average precipitation, and some parts of Cochrane District received 40-85% of average rainfall. Although there were cool conditions earlier in the month, a lot of GDDs accumulated rapidly in the last two weeks of May. Alfalfa green-up and growth does not seem as delayed as in other parts of the province: estimates suggest the first cut will be between the first and third week of June, which is at most one week delayed from normal. The main challenge will be grasses getting ahead of legume development. 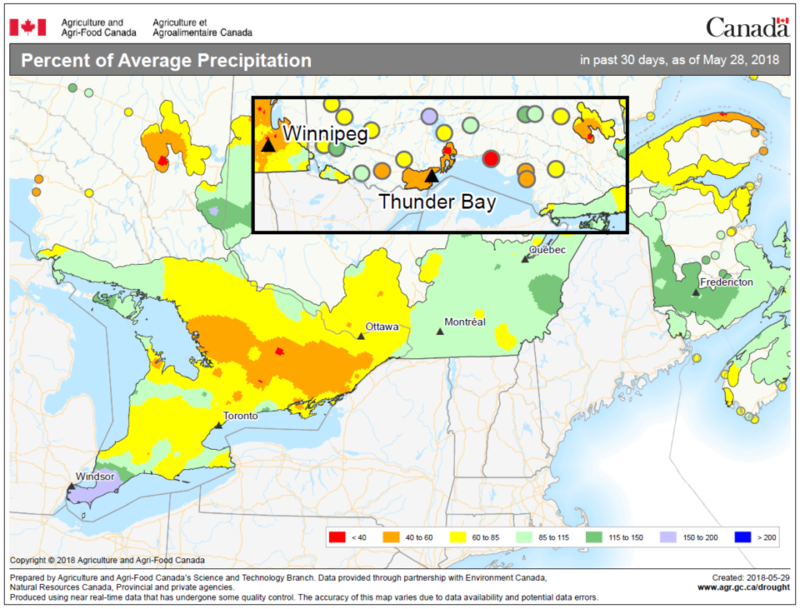 Rainy River District had average amounts of precipitation in May, while the agricultural region of Kenora District received 60-85% of average rainfall, and Thunder Bay District had 40-60% of average precipitation. Optimal dairy quality in first cut alfalfa occurs between 330-389 GDDs.